Digimon: System Restore: Xros Wars Episode 64: Arrival in Hong Kong! Protect the Super-Gorgeous Idol!! Xros Wars Episode 64: Arrival in Hong Kong! Protect the Super-Gorgeous Idol!! In this episode, the boys visit Nene in Hong Kong, where somehow hyper fanboy Tagiru isn't her creepiest stalker. Only the second creepiest. In a shocking twist, it turns out that the main characters have families. After the outstanding job Adventure, Tamers, and Savers did showing us how a child's involvement with Digimon impacts their loved ones, there's a real drought here. Xros Wars works in family members the least of any season, so we should welcome any effort that gets a parent or sibling involved. Yuu gets one of each here, and both say a lot about Yuu's family situation and validates many of the underlying reasons for his depression prior to Damemon's return. It just would have been great if this episode was actually about all that. Our first glimpse of the comprehensive Trailmon network in DigiQuartz has Kettle dropping the boy hunters in Hong Kong, suggesting either that whatever post-apocalyptic nightmare DigiQuartz is supposed to represent no longer has oceans or that the show's knowledge of basic geography hasn't improved since Zero Two's world tour. Just like the last character whose central narrative involved devout protection of his little brother, Nene's in the music business now! Her being an idol is totally incomprehensible and somehow totally befitting her character at the same time. While we never got a full picture of her when not under duress, our few glimpses suggest that she's confident, not afraid to create an impression through her appearance, and doesn't like to be predictable. Joining this business, seemingly on a whim, is completely insane and yet right up her alley. Last episode, Yuu explicitly said he never told Nene about the Hunt. 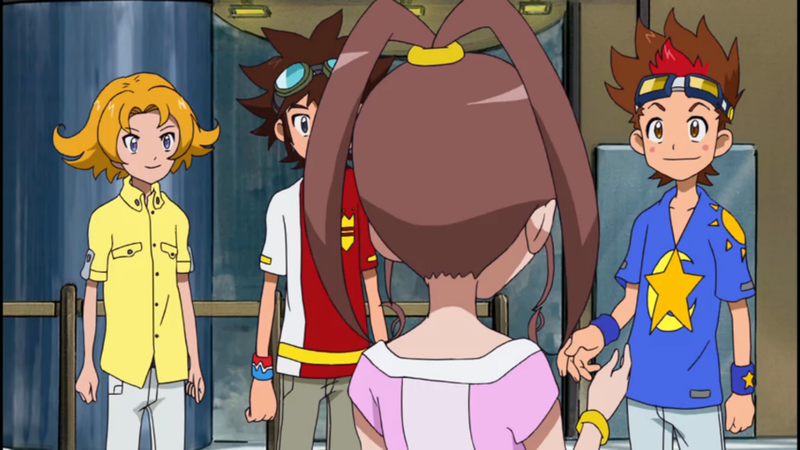 Now we find out that Nene somehow keeps her Xros Loader with her and somehow has Sparrowmon and Mervamon in it and somehow saw fit to use them after a mysterious entity took out one of her fans. This is the same entity that interrupts any of Tagiru's efforts to make physical contact with her. Tagiru's fanboyish behavior around Nene is so unprofessional that Yuu absolutely should have punched him in the face for spending so much of the episode gawking at his sister. The fact that this episode is so centered around Tagiru is another indication of how little this show knows about actually putting a good story together. Tagiru inexplicably gets thrown into a movie role after he stupidly mistakes an actor for the stalker (Nene's kick to his stomach does not quite make up for the lack of face punching, but it's a start). Tagiru ends up becoming the big hero in the battle against Harpymon, demanding to use an already depleted Sparrowmon in his digixros. Tagiru gets the big accolades and the sweet “thank you” from Nene, which may as well have been a kiss on the cheek the way he reacted. Let's throw in a second “Yuu absolutely should have punched him in the face” for good measure. This should have been a Yuu episode. We find out so much about Nene's family situation that much of it transfers to her brother as well. Nene is frustrated that her father is always working; he's not spending any more time with Yuu. He's not wrong in forbidding his fourteen-year-old daughter from going unsupervised to a foreign country to test the waters in a trade where appearance and sexuality is no small part of the equation, but Nene has so little respect for him that she does it anyway. It's hard to imagine Yuu feeling that differently about him. And once he leaves to keep tabs on her, he still strands Yuu in his giant lonely penthouse. There's enough sincere emotion in this ridiculous premise to survive, and it does fill in some blanks on Yuu's story. It's just a shame it's all done by proxy. Nene at least appears grounded and unaffected by her fame, only taking the limo because her manager insisted and willing to shake hands with Tagiru and that security guard. It's not hard to see the real Nene through this weird idol visage, even if Taiki sometimes has a hard time processing it. While Tagiru is horribly inappropriate obsessing over Yuu's sister, it's not the first time someone's gotten really weird about shaking an idol's hand. Don't forget how weird Miyako got about shaking Daisuke's hand in order to indirectly shake Ken's. It's kind of a big deal in Japan, to the point where some idol groups will hold special handshake events for fans who spend enough money. Tagiru steals a lot of the episode's attention with his embarrassing antics, but Taiki's reactions to Nene's stardom is hilarious. He can't believe the size of the car or the amount of food or the fact that she suddenly knows martial arts. He's actually quite horrified to see her in action. On that note, is it a normal thing for idol singers to suddenly be cast in martial arts movies? Not that this movie seemed like a legitimate operation. If Nene's character was supposed to be disguised as a boy, she wasn't very convincing. And that director seemed pretty lax about letting the idiot who attacked an actor fill in for said actor, and immediately filming with no rehearsal. At least Yuu calls BS on the whole operation. It does have to be said that the aerial battle between Harpymon and XrosUpArresterdramon looks really sweet with some fantastic angles flying up buildings. By now, everyone knows encores are pre-planned, with band members never gone for more than a few minutes after they take their bows. 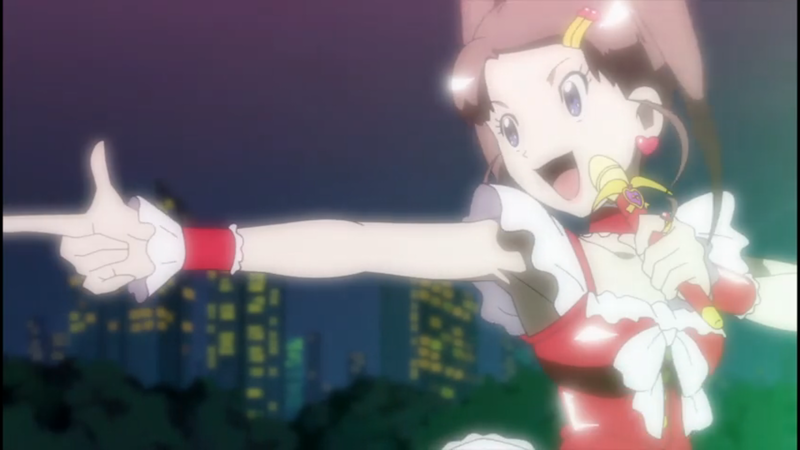 Nene leaves the stage, goes to DigiQuartz, rushes to join Tagiru and Taiki, participates in the battle, reconciles with her father, changes into a new outfit, then does her encore. All of that had to have taken at least twenty minutes, but the audience sticks around. Ah yes, this one, where everyone talks about Nene's daddy issues and how to fix them while Yuu is on the sidelines, no doubt thinking "Um, hey guys? He's my dad too, y'know..." Poor Yuu. 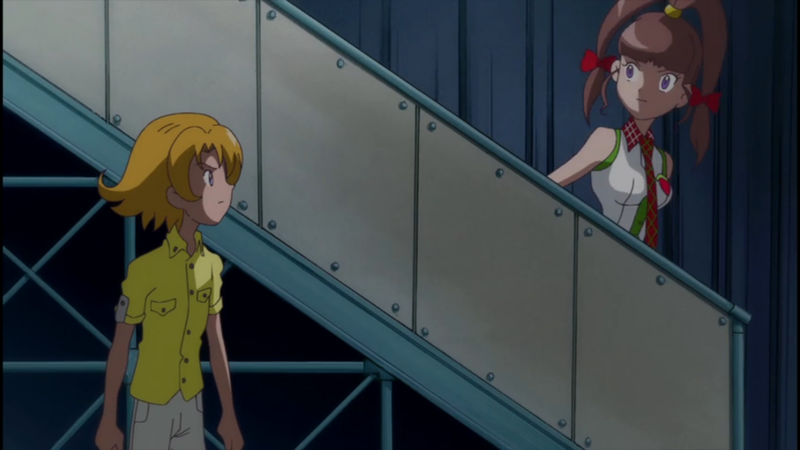 Also, even though she isn't that much fun in the first half of the series, I do question where the heck Airu is in this. When you combine idol fashion with a relative of her arch nemesis, it's shocking when she DOESN'T turn up in the episode!